Your Valentine's day outfit reminded me of the story of your very first shoes, a red sparkly pair that Grandma Bev bought for you before there was even a 'you' to speak of. Oh, those red sparkly shoes in the pictures? Those aren't them. Let me explain. About a hundred years ago (okay, maybe it was only 7 or 8 years ago, but in many ways, it feels like a lifetime!) Grandma took Aunt Janelle and I to do some holiday shopping along with long-time family friends. At our first stop, we happened upon the most adorable pair of sparkly red baby girl shoes you could ever imagine. They reminded me of the famous 'ruby slippers' from the Wizard of Oz, which I can't wait to watch with you, by the way. We oohed and aahed over those precious little shoes, wracking our brains for someone we could gift them to. When we failed to think of anyone who was expecting a baby girl, Aunt Janelle and I talked your Grandma into buying them anyway. Grandma decided to go ahead and buy them; then she dangled them in front of us and said "Whoever has a baby girl first gets them!" Your Grandma has been wanting to be a Grandmother for ages, and she packed those shoes away dreaming of the baby girl who would one day fill them. Aunt Janelle and I were both in different relationships at that time then we are now. Whether or not I'd even met your father yet is a matter of debate. (He remembers meeting me in 2003, but I swear we didn't meet until 2005.) Those snazzy shoes stayed tucked away through ups and downs, broken hearts, and new love...and they remained tucked away throughout my pregnancy, and are presumably tucked away somewhere still today. You see, shortly after we found out that you would be a girl, I started pestering Grandma about the ruby slippers. She swears up and down that she's looked everywhere time and again, but she must have packed them away so securely that they've become camouflaged in a sea of long forgotten items. While her memory of where precious items have been stored may leave a bit to be desired, she is a woman of her word. 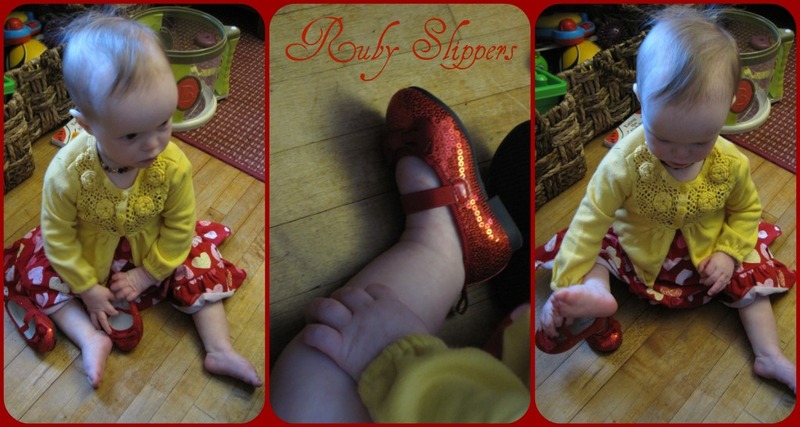 She would not rest until her first grand-baby was the rightful owner of the ruby slippers that were her birthright. By just as much chance as we happened upon the first pair, she happened upon a similar pair during her holiday shopping last year, and presented them to you for Christmas. As luck often has it, I'm sure we'll find the original pair just as soon as your dainty little feet are too big for them! Anytime you find yourself questioning whether or not you are wanted this earth, I'll be sure to remind you of the tale of the sparkly red shoes. If you like this blog, and haven't done so lately, please vote for 'Dear Delilah, Fine and Fair' on Babble's Top 50 Mom Blogs. I'm currently at # 44. Thanks for your support! Those are the greatest shoes ever! What a beautiful story.... your daughter is going to love having this collection of stories and letters to read someday. Again, they're just too good on her sweet little feet. Those are so adorable! 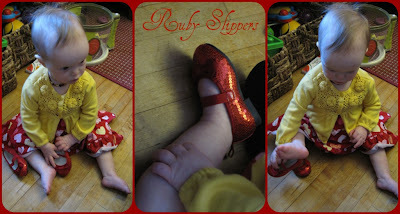 What is it about those ruby slippers that make us want a pair... no matter our age? I keep trying on the biggest kid size to no avail. What a special story! Thanks for sharing. The Wizard of Oz has become a favorite in our house and we are on our 3rd pair of Ruby Slippers!